Snow White Pearl exterior and Satin Black interior. 3rd Row Seat, Heated Leather Seats, Bluetooth, iPod/MP3 Input, Dual Zone A/C, CD Player, Alloy Wheels, SNOW WHITE PEARL, Rear Air, Satellite Radio, Back-Up Camera. READ MORE! Leather Seats, Third Row Seat, Rear Air, Heated Driver Seat, Back-Up Camera, Satellite Radio, iPod/MP3 Input, Bluetooth, CD Player, Aluminum Wheels, Dual Zone A/C, Smart Device Integration, Heated Seats, Heated Leather Seats Rear Spoiler, MP3 Player, Privacy Glass, Keyless Entry, Child Safety Locks. SNOW WHITE PEARL. 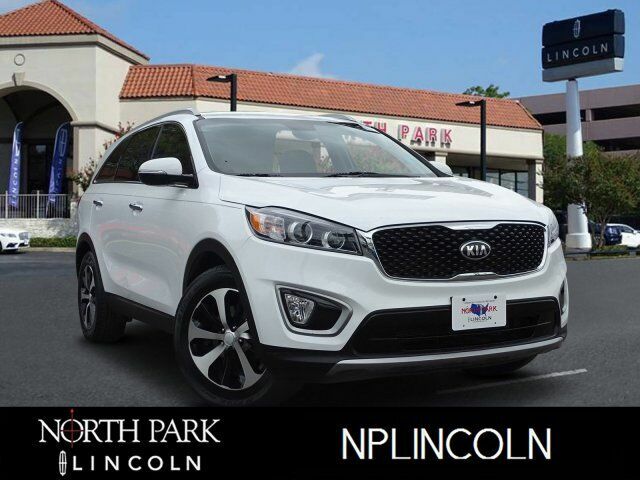 2016 Kia Sorento with Snow White Pearl exterior and Satin Black interior features a V6 Cylinder Engine with 290 HP at 6400 RPM*. Great Gas Mileage: 26 MPG Hwy. KBB.com`s review says The 6-speed automatic transmission is as smooth and unobtrusive as you could hope for, and the suspension never called attention to itself for being too harsh or too soft..